We Offer the Following Fender Styles: Quarter, Full Radius Single Axle, Full Radius Lift Axle Single Tire, Half Circle, Single Axle, Half Tandem Single Radius, Full Tandem, Single Radius, Full Tandem, Double Radius Fenders. In the Following Finishes: 0.90” Ribbed & Mill Finish Aluminum, 0.105” Diamond Plate Aluminum, 0.112” Polished 5052 Aluminum, 14 Ga 304 Stainless Steel And 14 Ga Mild Steel Black Powder Coat finishes. Fender Mounting Brackets Available for Each Style of Fender in Stainless Steel or Powder Coated Black Mild Steel Sold as A Pair That Mounts Two Fenders or Individually. 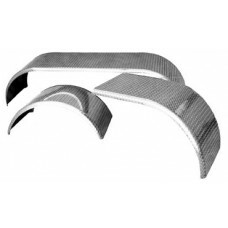 Protech Fender Bracket Help Sheet We Offer the Following Fender Styles: Quarter, Full Radius Single..